$0.99 (regularly $9.97) 10/27/2016 - 10/29/2016! Bestselling Author, Alex Goldstein, brings a unique perspective that many others do not. As a successful realtor and investor, Alex has been on both sides of a real estate transaction, so he knows what strategies and techniques will lead to a successful deal, and which ones should be avoided at all costs. That’s why he chose the name, ""No Nonsense Real Estate,"" for his third book. Goldstein offers practical, proven home buying techniques, free of fluff or confusing jargon. 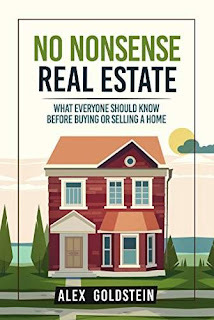 This book is for anyone who is getting ready to buy or sell a home and wants to be as informed as possible as they get ready to begin the process so there are no surprises – whether they will be working with a realtor or doing it on their own. You also receive three free gifts. Goldstein has put together a special document answering the most popular questions every buyer, seller or investor has during a real estate transaction. You also get special access to an easy-to-understand glossary of the most popular real estate jargon. Last but not least, every reader is access to a free video training that will teach you how to choose the best home for your family.